Patene Artectura, a unique coloration system applied topically, turns concrete into your “canvas” for creating an unlimited range of artistic statements. Want to simulate a sun-bleached flagstone or fine Italian marble? 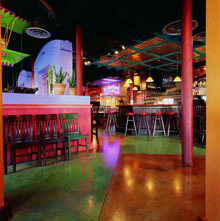 Patene Artectura achieves design options that create one-of-a-kind floors that are durable and easy to maintain. Patene Artectura is a system of specialized coloring techniques that lets you enhance ordinary concrete projects with a world of creative effects. Whether your next project is a quiet residential entry, a commercial countertop or a high-traffic restaurant floor, With Patene Artectura coloration systems, you get a virtually unlimited range of options to fit any budget, any design criteria. Patene Artectura is the efficient, affordable way to transform plain, gray concrete into beautiful, artistic spaces. Indoors or outdoors, residential or commercial, new construction or retrofit… Patene Artectura offers the kind of versatility traditional concrete treatments can’t match and can be combined with our Imprint Systems, Toppings Systems, Custom Polishing Systems or precast elements to create architectural concrete that is nothing short of breathtaking. 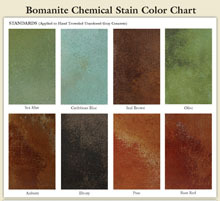 The Patene Artectura Coloration System is applied by specially trained and licensed Bomanite Contractors, ensuring consistent quality in every application. Every Bomanite Licensed Contractor is part of a network of architectural concrete experts – professionals who receive ongoing technical training to ensure that your project is completed on time, on budget, and beyond your expectations.